Update: The Shipwreck closed Nov 18, 2012. 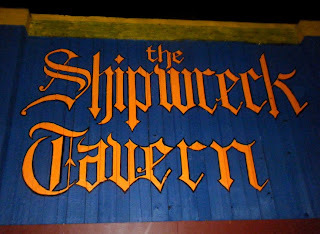 The Shipwreck is a nifty neighborhood tavern -- and a true tavern, not just because it is limited to beer and wine, but because it has that old, stolid, tavern feel. The curveball is an open upper level with a ping pong table curiously placed over the main bar, which makes the evening vaguely redolent of "Captain Kangaroo" with cascades of ping pong balls popping into your beer at any moment. Yet another pleasant addition to the California stretch of West Seattle. Historical Notes: The "Happy Hour Tavern" is listed at this location from 1948 into at least 1970. In 1980 it is "Ye Old Hour, " in 1985 "Luther's Pub," and in 1990 it is "TNT's Place." Go sis! Hope business is booming up there in Seattle! Best wishes!